spectrometer is the only AES instrument in the world that specified < 8 nm of Auger spatial resolution. analysis on the sample which has very small features. In Auger analysis (spectrum, depth profile or mapping), it is necessary to set AES analysis point with SEM image. A fine focused electron beam is required for SEM imaging and an extremely stable electron beam at enough current for AES analysis is required at a time. PHI 710 provides < 3 nm of SEM spatial resolution by reducing the noise from power supply (Fig 1). AES spatial resolution reached to < 8 nm (@ 20 kV, 1 nA) by adopting an acoustic enclosure box, which minimizes the effect of vibration, sound, and temperature change (Fig.1). Fig. 2 shows imaging of the grain boundary inclusion from torn surface of a ductile cast iron. A secondary electron image (left), overlaid Auger mapping image for Ca, Mg, & Ti (center), and sulfur Auger mapping image(right) are shown. It clearly shows that PHI 710 can achieve AES chemical analysis in small scales, like an inclusion only a few dozen nm in size. 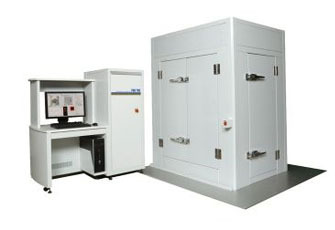 Coaxial CMA (Cylindrical Mirror Analyzer) is PHI's unique electron spectrometer which has the electron gun on the central axis of it. CMA has a strong advantage of making less likely to be affected by sample shape or tilt angle, because CMA can capture Auger electron emitted in 360 degrees from the sample. Fig. 3 shows the difference of sensitivity characteristics between coaxial CMA and non-coaxial spectrometer (SCA). CMA has high sensitivity characteristic from vertical incidence to oblique incident, while achieving a flat sensitivity characteristic with low angle dependence. Therefore PHI 710 can provide superior quantitative data at various incidence angles and sample shapes. Fig. 4 shows the comparison of CMA and SCA by SEM image and Auger mapping image of Sn balls on Cu. While Auger mapping image by SCA shows a significant shadow effect, Auger mapping image by CMA is clearly corresponding with the SEM image without shadow, providing accurate understanding of sample. PHI 710 can get spectrum mapping data in Auger mapping analysis, which maintains the spectrum for each pixel. This function provides a chemical state mapping image based on spectral analysis from each pixel. Fig. 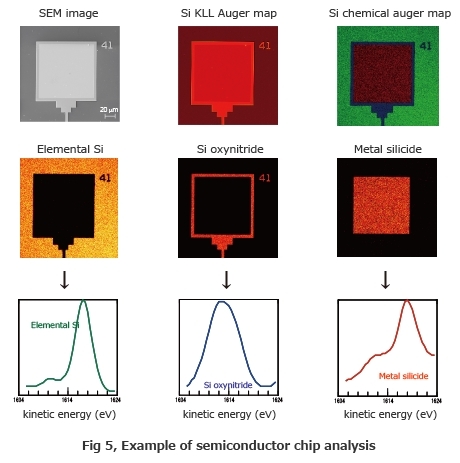 5 shows results of Si KLL spectrum mapping measurement of a semiconductor chip electrode. Applying Linear Least Squares Fitting (LLS) data process to the Si KLL spectrum, mapping image clearly shows the three separated areas consisting of elemental Si, Si oxynitride, and metal silicide. Lower column shows the Si KLL spectrum extracted from the map data, for each of the three states.